Not sure if even I get this. A weeping, begging creature that defies belief. Outside Bloomingdale’s on the corner of 59th and Lexington. Is this for real? 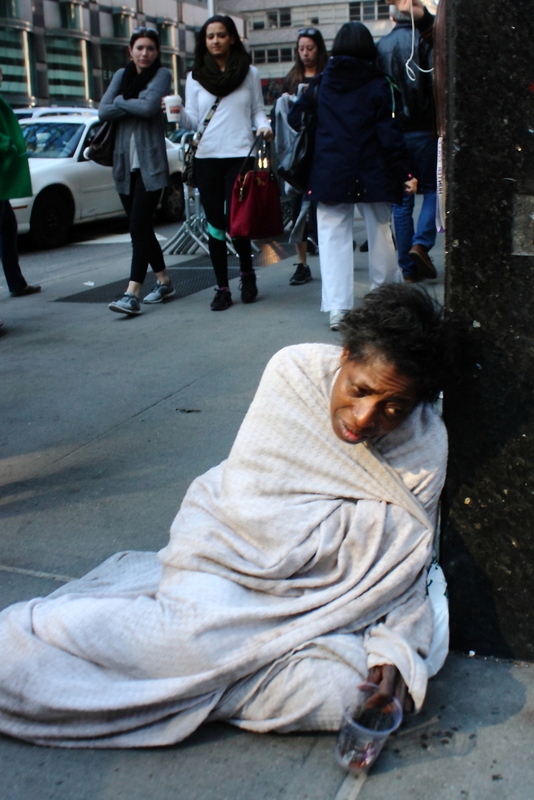 This ‘homeless’ woman wrapped in bed sheets, her face stained with tears. Maybe I am getting a little too cynical, maybe the streets of New York have hardened me as to what to expect, but I am not quite so sure about this one. After walking a few blocks, I had to turn around and go back to look again at this poor, unfortunate woman. She was gone? This is what life on the ‘street’ is all about and why I choose to do what I do, but this image of despair was almost Dickensian and shocking in so many ways. I have no idea why I feel so reluctant to accept this as ‘real’ perhaps it is too real. Shame on me if I have got this wrong. And shame on New York City if this is her reality. It shakes me to the core either way. This makes us, me, wonder if there is no end to the unfortunate condition of the homeless, who are unaware or don’t care where they lay down to rest. My kids and I drive by the “homeless family” who stand by the entrance of the grocery store holding a sign telling people their condition and asking for change. One homeless man stands by Wall Mart holding a sign that tells us he’s a disabled veteran. Granted this is Lowell, MA, a city of 100,000 people, a fraction the size of New York; but the message is the same: this world isn’t any kinder to the homeless. Whether it’s outside Bloomingdales or Wall Mart, those who can’t gather the strength to fight poverty and instead rely on a few dollars from people who can’t not give them money, are essentially the same. What got me, if we have a choice, do we have that option? Would we do this? I doubt it. You have a great heart Bob. And you tell a great story. What now? We hold what is dear to us and we hold them tight, should they fall! Even here in Canada, where the social safety net has been more secure than in many parts of America, we are finding that it is not enough. As a retired secondary school teacher from a small community, what I have learned is that the range of abilities of individuals is much greater than our society wants to admit. The range of aptitudes, learning & communication process capabilities are spread across a very wide spectrum. This does not include other factors such a mental & physical health and family support & income. North American society runs on a business model that does not want to acknowledge the spread if there is no profit in it. Any health or learning challenges will be supported/alleviated if someone can pay or if they are fortunate enough to get some sort of assistance from social institutions. The rest fall through the cracks, some end up sleeping & weeping on cracked pavement. It’s so hard to know nowadays. We had a mother run to our car…saying she needed help…her kids were locked in the car and she had no money for gas, etc. We said we would call the police for her. She said, “no.” We said we would go to the care with her. She said, “no,” again. Finally she got angry and ran to someone else. She does this everyday. We have seen her before. It’s how she makes her living. i don’t think she has any kids. You don’t know who you can trust anymore. It’s sad. I saw a show with people who do this for a living…laughing, because they make more than the people who help them. Very sad. We judge! That’s what we do and we rely on our instinct! We have nothing else here. Sadly it is ‘us and them’ whoever they are. We protect what is dear to us. You did the right thing. You will know when it is the right thing to do. I understand, some are pros. But what L&R captured is despair. It leaps from the image I believe. You are right, despair it most certainly is. Thanks for the comment. There is less and less money available for the mentally ill. What you see here appears to be one of the unfortunate souls who are afflicted. We are real good at building prisons, but not so good at providing services to the homeless who are often, but not always, mentally ill or have substance abuse issues, or both. I agree with every word you say. In England it was (rather comically) called ‘Care in the Community’ What it actually meant was kick the most needy out of hostels, hospitals etc and leave someone else to deal with them! It was never made clear who that ‘someone else’ was but it relieved the burden on local government finances. Heartwarming eh! A powerful image, real or not. Terribly sad, if indeed it is real, how did you feel taking her photo? Did you speak to her? No! I had no words. I guess when faced with this appalling situation we try and find something comforting to say, I couldn’t find any, sadly, for both of us. Thanks for the comment. The worst scum are the ones pretending to be homeless adding to our cynicism. It’s hard to tell real need from fake at times, but I go with my impulse. Sometimes, just giving some dog treats for what seems to be the ubiquitous underfed dog around here. I hate to be cynical, it clouds and taints our judgment. But this image was such a cliche, it just doesn’t sit well with me. I find myself hovering on that razor’s edge myself. I suspect all we can do is go with our gut instinct. You are right, sad either way! Thanks for the comment. The Police could have moved her on, or perhaps Bloomingdale’s had her removed. It doesn’t quite fit with their market position to have such desperation on their doorstep. Who knows. I will be looking out for her on the streets of NYC. Oh, Jesus! Anton! Real or not, what led this woman to be there is real. Whatever that reason was. Either way, it shakes me. We don’t judge based on the old “deserving poor” principle any more. I no longer ask myself whether the reduced-to-this person has a valid reason to be there. Any reason that takes a woman to a street corner wrapped in dirty bedclothes is valid. I KNEW I shouldn’t have come to this corner today. Thanks, Anton. I am new over here so I shall not post a run on comment, although this particular topic I could discuss fro ages..Humans are such complex, beautiful, ugly, mysterious beings and the way we allow homelessness to thrive globally appalls and mystifies me..I once was homeless with my children living under a freeway for a few days.. do you know not one person stopped..not one.. fortunately for me I got creative, got to moving, got a job, home etc so my stay was brief.. many are not so fortunate..through your photos these people are not invisible and for that I thank you..
What an amazingly strong woman you must be. To find yourself in that situation with children relying on you and to somehow pull yourself and your family out of that dark place is an incredible achievement. The fact that no one stopped to help is a sad example of the cold and uncaring society we inhabit. I am so pleased that your story has a happy ending. So many others do not. Thank you so much for your comment. This composition blew me away. This is a great capture with a deep social message. Thank you for taking the time to comment. It is a horribly tragic image. What a heartfelt photo you took and yes, it is sad. New York is not alone. Many majour cities around the world are the same. Montreal, Toronto, New York, Chicago, San Francisco …Photos, posts, articles, more and more awareness certainly can help. It is a global problem and one that is going away anytime soon. Thanks for your comment. Every day and night coming from work I see these homeless people at the subway and write about them but don’t feel comfortable taking a photo without their permission. Heart wrenching shot, the ethical dilemma of the photographer is present. However, even more present is the question: how did we come to this ? Great photography. Thanks, it is as you say, a constant dilemma as to the social value of the image against the feeling of exploitation of the subject. How ‘we’ came to this is a whole other story. Thanks for the comment. Reblogged this on The Proverbial Middle Finger. Reblogged this one. Words fall short I’m attempting to fully describe this image. I understand exactly what you mean. It left me speechless too. Very touching frame .. this contrast in life will widen year after year ??? Sadly, you are right, the divide grows by the day. Thanks for the comment. capitalism and its discontents. this image troubles me. i don’t know if it is helplessness, a grand fraud or entrepreneurial culture at its grossest, maybe even a combination of all three. Beautifully put, I think the disturbing thing is that the image looks like it is from another age. Not here and now in NYC. I think I prefer to think of her motives as some kind of smoke and mirror illusion for personal gain. The other option is far to distressing to consider. Thanks for the comment Martin. I would rather be ripped off than ignore someone in genuine need. A brutal, honest shot. Brutal is the word, and I agree with you, far better to be taken advantage of than have to live with the fact that you did nothing. Thanks for the comment.